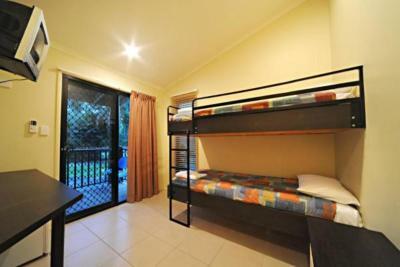 Lock in a great price for Discovery Parks – Airlie Beach – rated 8 by recent guests! Good location, most of the tour can arrange courtesy pick up from this park. Very good value, clean, great waterpark for kids, perfect for families. Good location. We enjoyed the morning bird feeding. All staff were amazing. Kids playground was perfect as well as the water park and pool. The Airlie Cove Caravan Park is still undergoing repairs after Cyclone Debbie. We stayed in Cabin #7which is one of the newer cabins and it was fantastic. It was close to the entrance and pool area but still very quiet. 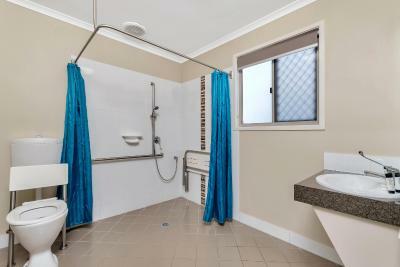 It was a one bedroom and had two tvs as well as an updated kitchen and flooring and bathroom. All the facilities in the cabin were top notch. The bird feeding at 8 am is a must even if you are not a kid. The pool area was also nice for children. 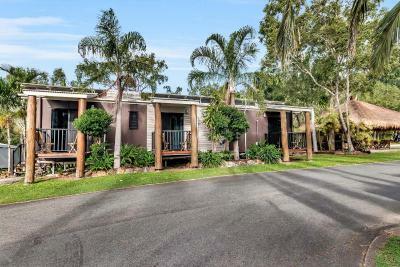 The location is close to Airlie Beach, Shute Harbour and Conway National Park for hiking. Our young boys loved the bird feeding, playground and waterpark/pool. Camp kitchen was great for cooking dinner. The nearby Jubilee Tavern was also great for a meal with a play area for the kids. Room was very comfortable and clean. Instructions were very easy to follow, though a little unclear as to where the allocated parking was for the cabin. I like all the facilities offered for guests including the playground, laundry and swimming pool. Also, the room was clean and it is very comfortable. If I could I would stay more days there for sure. 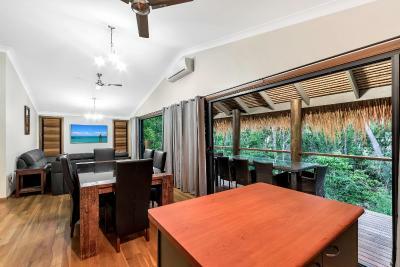 Discovery Parks – Airlie Beach This rating is a reflection of how the property compares to the industry standard when it comes to price, facilities and services available. It's based on a self-evaluation by the property. Use this rating to help choose your stay! 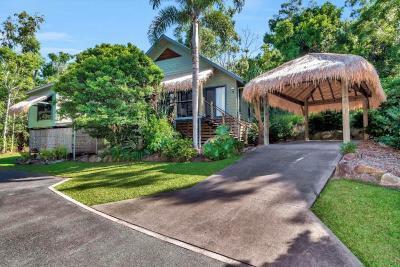 Boasting both garden and mountain views from all villas, Discovery Parks – Airlie Beach offers accommodations in Airlie Beach, Whitsundays. The holiday park boats an outdoor pool, waterpark and hot tub. Free parking is available. 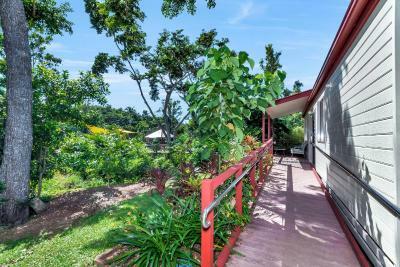 All bungalows include a refrigerator, flat-screen TV, air-conditioning and private bathroom. Some villas at the holiday park have fully equipped kitchens and a balcony. 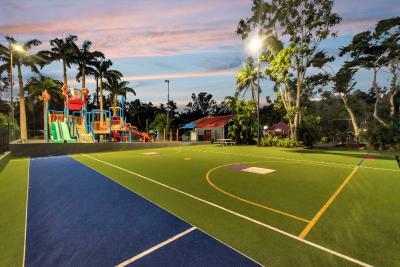 Other facilities features at Discovery Parks – Airlie Beach include a children’s playground, a games room and bouncing pillow. 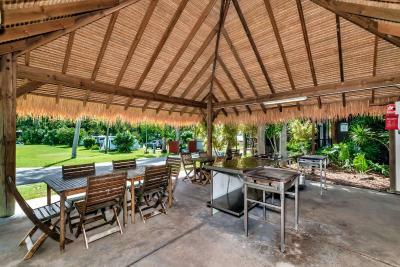 Explore the surrounding areas or relax on-site and prepare a meal with the shared BBQ facilities. There is also a mini market onsite. 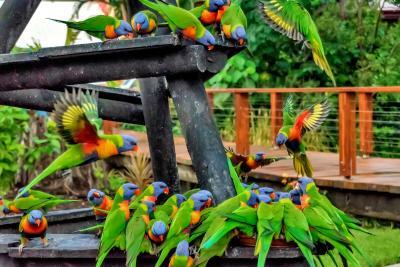 Discovery Parks – Airlie Beach is located just a 3-minute drive from Port of Airlie. 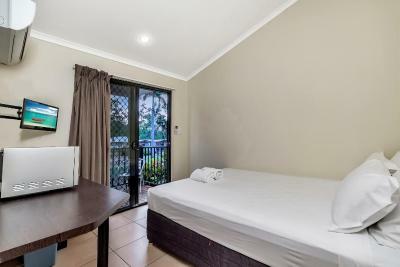 When would you like to stay at Discovery Parks – Airlie Beach? 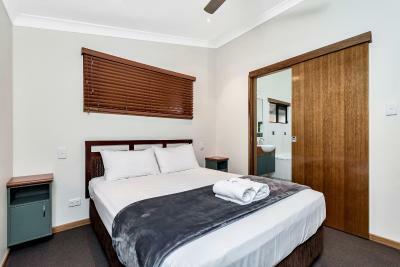 These beautifully appointed luxury Villas offer a spacious bathroom with a separate toilet and a lounge and dining room with a TV and a DVD player. There is also a large kitchen with a oven and a dishwasher. Large sliding doors open onto a wooden furnished deck and there is double undercover parking alongside. 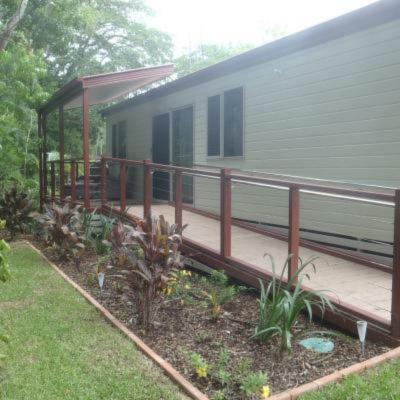 These cabins offer a kitchen, bathroom and a dining/lounge area with a TV and satellite channels. There is also parking alongside the Cabin. These open plan Cabins offer a bathroom, kitchen, lounge/dining areas with a TV and a furnished deck with parking alongside. These modern studios offer a TV, private bathroom, tea and coffee making facilities and a bar fridge. Linen is provided. Please note that that this can accommodate 2 people only. This includes children of all ages. There is strictly no capacity for additional guests. This air-conditioned villa features an private bathroom and a fully equipped kitchen with a large refrigerator and a stovetop. 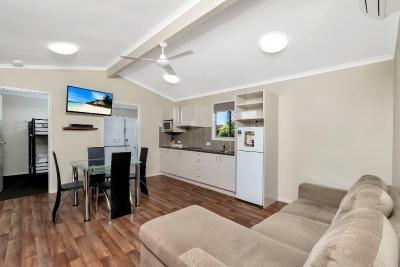 It also offers a lounge area, flat screen TV with cable channels and a furnished patio. Car parking is available alongside the villa. This villa has a dining area, stovetop and kitchen. This villa features a microwave, stovetop and air conditioning. This studio has a microwave, air conditioning and electric kettle. 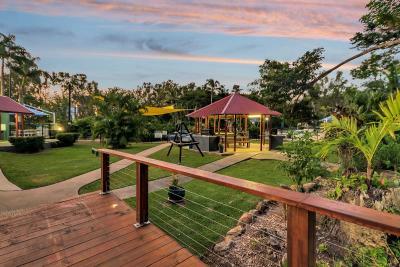 House Rules Discovery Parks – Airlie Beach takes special requests – add in the next step! 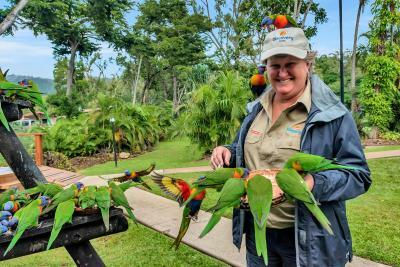 Discovery Parks – Airlie Beach accepts these cards and reserves the right to temporarily hold an amount prior to arrival. Safe and secure and child friendly. Wifi signal wasn’t strong, but it didn’t matter too much as we were always out exploring. 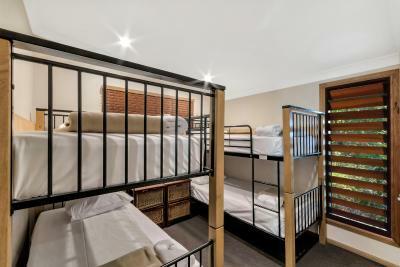 The bunk beds had slats missing, so that the mattress sagged down between them. The laminate in the shower, down low was all cracked and peeled away, it didn't look very nice at all. I thought the play area could have been closer together so that you didn't have to go literally, from one side of the park to the other, ri get to the different play area. I love the idea of having enough kids entertainment in the accommodation grounds. Staff were very friendly. Very clean, lovely staff and they had Easter activities for the kids too. Pool and water play areas great for kids. Some dodgy wiring around pool area and the drainage up to slide in main pool could be improved. Our cabin was old rundown and dirty. The hot water wouldn't work if cold was on to fast. Bathroom window had no lock. Cabin door very hard to lock when leaving. There wasn’t anything to dislike. The water park was awesome my daughter absolutely loved it. Price was great.